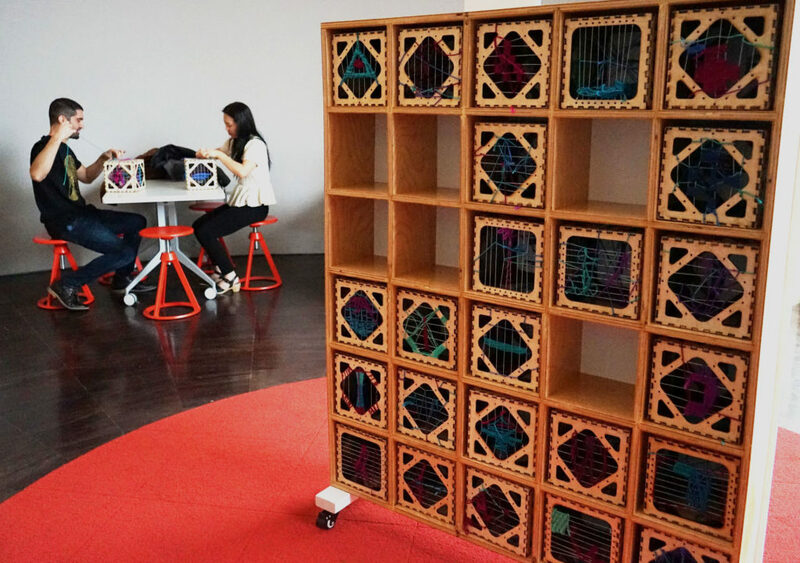 In a corner of the museum known as the “Meredith Lounge,” located between our Film & Video gallery and Latin American Art galleries, visitors may have noticed a square wooden structure filled with small cubes adorned with colorful yarn. This interactive project titled Mindful Weaving invites Blanton visitors to engage their creative minds and weave designs at their leisure. Interwoven with the museum is its co-creator, Alyssa Leleux, the education intern with the Blanton since May of 2017. She has helped lead art programs at the museum, and through Mindful Weaving, continues to provide a space for learning at the Blanton. Her experience working with the museum helped influence her proposal for an interactive art project based on mindfulness and free expression. With co-creator Arohi Ranade, the pair used UT Art Professor & Guggenheim Fellow Margo Sawyer’s sculpture class as a basis for their collaboration in the Spring of 2018. 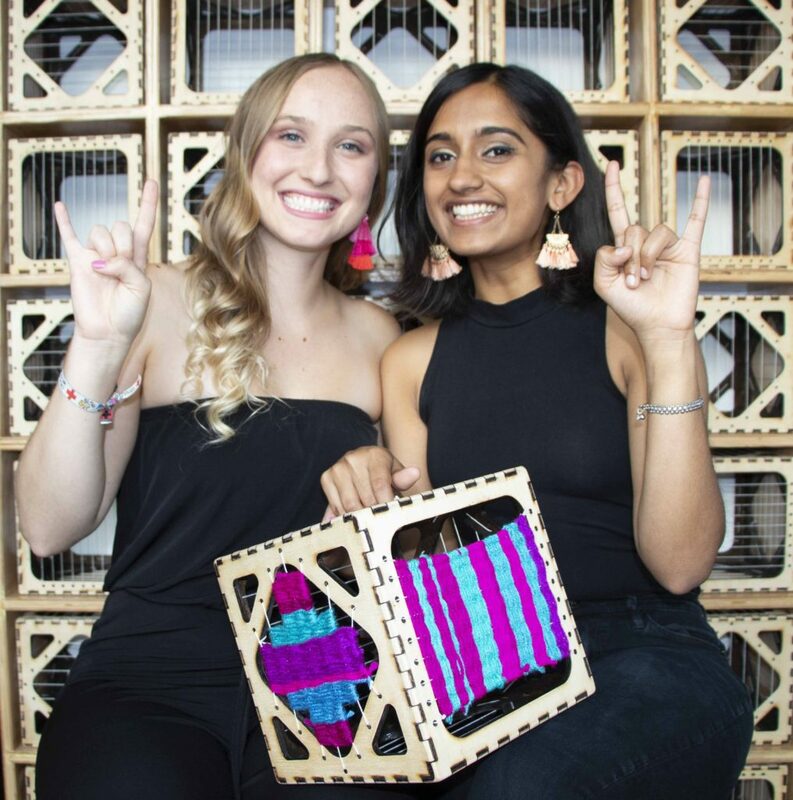 Over the course of seven months, Alyssa and Arohi crafted their proposal and spent countless hours building the wooden structure containing 30 intricately-made cube looms. The main objective of the project was to provide a meditative space for museum patrons to unwind from their busy lives. 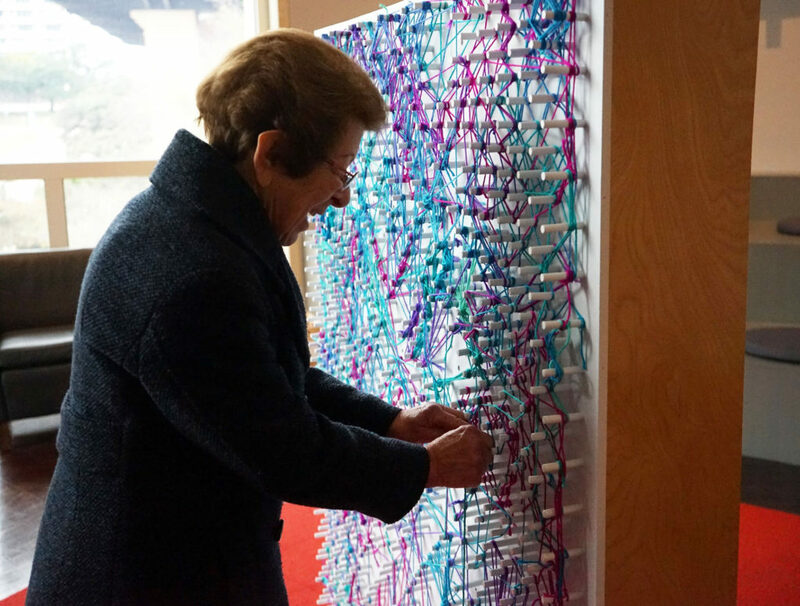 Visitors are invited to create designs out of yarn on the collaborative weaving wall and the cube looms. Alyssa: Mental health is something that we both have experience dealing with and I come from having anxiety and using art as a way to work through my emotions. So art therapy was very much a coping mechanism for both of us from our personal experiences. We wanted to give a place, an art piece, that allowed people to just take a break from their daily crazy lives and the thoughts that are in their head. To just focus on something as simple as weaving and to allow them to have that little break of time to contribute to the project and leaving something behind in a selfless way, it’s a process based making. They don’t get to take home this piece of cloth that they wove, it’s very much a gift to the public that someone else can add to it and someone else can contribute to it. I think that had a lot to do with our decision of mindfulness and our decision of weaving. 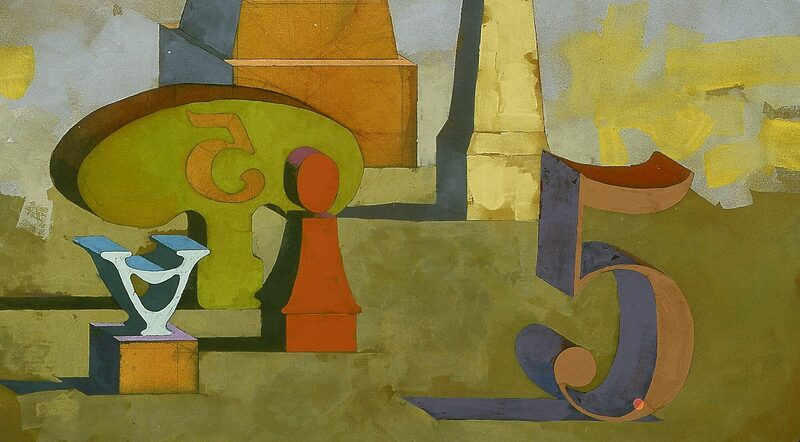 Did you have any insights during the creation of this work? Arohi: We were always thinking of the tactile nature of the piece when people were going to be interacting with it. So for the cubes, when we were sanding them, we would be touching them how people would normally be touching them too. It was very tactile for us. I still remember the amount of sanding that it needed on the edges. Alyssa: There was a shocking amount of handwork that we didn’t expect at the beginning. And the safety and softness of the cubes were extremely important. How can you relax when you’re holding an aggressive object? It needed to be soft, it needed to be welcoming. It needed to be a calm object to hold in your hands. We very much focused on that, and that’s why we spent so many hours on every single cube. Giving it the love and care that it needed. Arohi: It’s very interesting how people have been working and weaving on it, there is some sort of giving back of the labor we put into it. Over the course of this time, people have put so much work and so many hours into it. Alyssa: It’s really cool to think about it, we went from May to September purely building and now it’s November and people have been working on it and working on it. How does the work of the Blanton influence Mindful Weaving? Alyssa: A big reason why we wanted it to be in the Meredith Lounge is for visitors to observe the art in galleries, appreciate it, be inspired by it, get excited about it, but then go use that inspiration, go use those creative juices. Going from looking and observing to actually making art of your own, that was something that was super important to us. We are constantly inspired by artists, we are constantly looking at art as artists and what you see really does influence the way you make, the people you talk with, and the conversations that you have. Allowing the public to have that same kind of experience was something we wanted. Arohi: Also jumping off from that, viewing art sometimes can be a passive activity for those who don’t already necessarily make art. For example, I’m from an engineering, public health background and for me, when I would go to art museums prior to being in studio, there was kind of a disconnect sometimes. I thought since the Blanton visitors are not all from an art background, it would be a chance for some to have an avenue into artmaking. Not just passively viewing art online or in the Blanton itself, but making and realizing you can do it. Do you find this work to be very accessible to all people? Was that important for you? Arohi: We wanted people to have that freedom to experiment and have those free play moments, I think both of us wanted it to be an exercise in repetition and an exercise in freedom. Complete autonomy over a small piece in this communal work. I think we wanted it to be accessible to all ages. Alyssa: No matter the background, I feel that the most simplistic weave is just as significant as the most complex weave. No matter what, someone took the time to create in the way they felt best suited their experience. 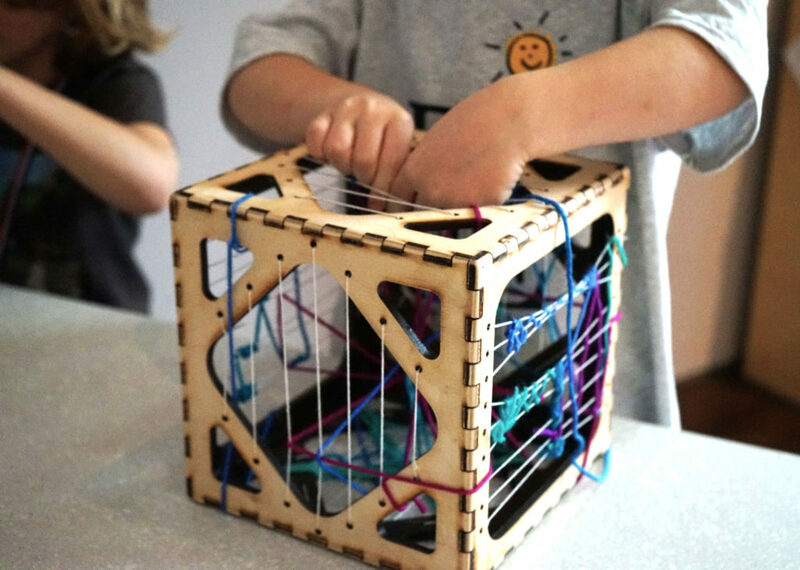 For a child, maybe the only thing they can do is tie a knot and weave it all the way through the cube. In contrast, there was a man who was an artist who did a very complex weave and there was a woman whose background was in weaving. Everyone comes from different angles. Arohi: We wanted it to be a happy thing to do. We wanted this sort of pocket of happiness, bliss, and mindfulness. Have you had any realizations watching people interact with this exhibit? Has anything about how people treat it surprised you? Arohi: It’s really these small moments where we just realized that we feel like we’re truly collaborators, we’re not giving them a puzzle that they have to solve, rather they’re giving us new information that we’ve never seen before. Even some of the designs that were created on the weaving wall, I had completed only imagined abstractions, but people created patterns, things I had never imagined. Alyssa: The color layering has been super interesting. I often see people go off of one person’s design and expand and expand and expand it. Days will pass where a new individual sees that design and they want to keep adding to it. It’s really neat to have a work that shows time passing and that was something that we were super fascinated by, the idea of time within art. And so each day it grows and it changes. Each day it will never be the same. As it is one day, it won’t be the same the next. How has your status as two female artists influenced your work and your movement through the art world? Arohi: There are a lot of interesting elements within Mindful Weaving itself, for example weaving as an art form was relegated to the lower arts and crafts standpoint. The fact that we were able to work with a higher institution like the Blanton and have weaving be part of this contemporary space is exciting to us. From my perspective, the historical female weavers that I have seen have been cast into a craft’s position. We really want everyone to be able to view weaving as something that can stand on its own in the art stance. We wanted to carry that message forward as female artists. We’re working in the frame of mind, such as Anni Albers and other weavers, have been in. Alyssa: I have to say that Monique O’Neil, who works with the Family and Community Programs at the Blanton, believed in us from the very beginning and she heard our ideas out, gave us real world advice, and helped us get it to its perfect design state. She told us, “I believe in this so much this will happen. We will make this happen. We believe in y’all as artists, we believe in y’all as students and we want this collaboration to work.” Also Ray, who is the director of education here, he was super supportive in the entire process and in the proposal. It was really beautiful to have educators see the need for this project to exist in their museum and for them to really believe in us and encourage us through really all the tough times too. We couldn’t have asked for a better support system. Truly, it was incredible. Arohi: I think Margo and Monique were both women in positions of power that helped us. That I think would be the most relevant to us being women in art. We had female role models who really encouraged us and believed in us. Do you think this piece builds a sense of community? 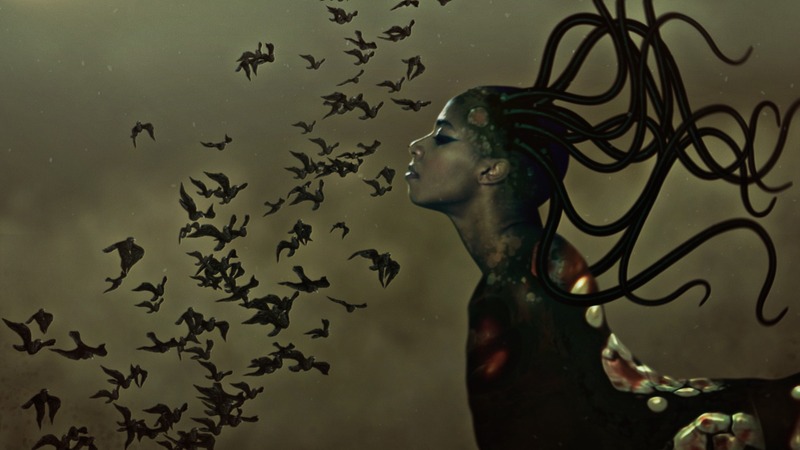 What inspired the collaborative nature of this piece? Arohi: I think the collaborative nature of it really came into being once we realized we cared so much about our community here in Austin. When we were envisioning a public work, we wanted to incorporate things like mindfulness and interaction. When it came to interaction, we wanted not just interaction between us and one individual, but rather everyone all together. Communality is also really intrinsic in the act of weaving. Alyssa: Quiltmaking and old forms of weaving with actual looms is a very communal thing. It creates this safe space for conversation and there are quilting groups that we wanted our space to also mimic. We wanted a place to meet others and weave together with safe conversation. The thought of community art for me has always been an interest and always been a focus because of my background in art education. I hope to work with a variety of different communities in the future through museum education and so I was super interested in how something made for all ages can come together as one thing. There’s not often this space for all ages to interact together, so we’ll have 4 year olds sitting next to college students or an older adult. I find that that’s very rare in the art education world and so allowing that to be a real space is exciting. How has the public’s interactions with Mindful Weaving affected you? Alyssa: Getting the chance to be one of the artists for the project and the person who gets to see the community enjoy it has been the most exciting and heartwarming experience because I get to communicate with the public. I get to hear feedback directly from the community, I get to see the adults, I get to see the children, I get to see the students making on it and actually enjoy all of what Mindful Weaving is, especially when joined by a collaborative conversation between strangers where people will sit together and basically create this weaving community. It was a goal of ours to make it a very calming environment. Getting to see the range of all ages has been remarkable. Just seeing something that was on a sketch to real life has been the coolest experience. Arohi: It has been much more of an emotional experience for us than I would have expected. I feel a sense of pride, even more so than at the opening. I feel more pride in the work that people do on it. It feels like a partnership with the public of Austin. It feels like we’re giving back to the community and the community is giving back to us.